Seven Layers of Italian flavor and ingredient heaven! 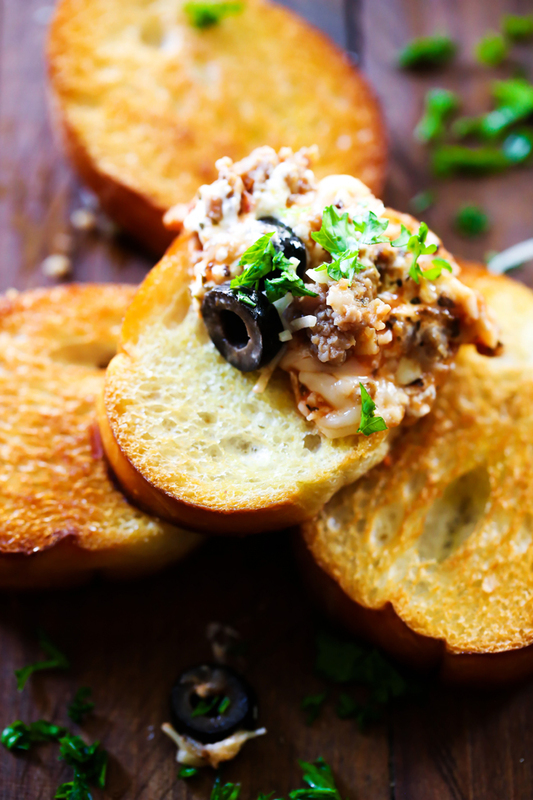 This will be one appetizer you get requests to serve over and over again! A couple weeks ago, my mom and I were sitting down and brainstorming some delicious appetizer ideas. With holidays, company and football all going on, delicious, people pleasing appetizers are A MUST! My mom spouted out what I feel to be a brilliant idea. 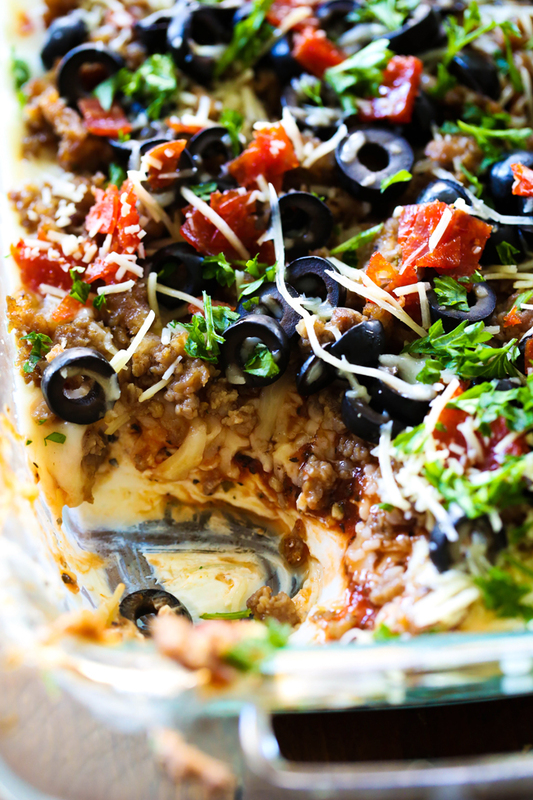 Seven Layer Italian Dip. The idea obviously stemmed from the ever so popular 7 layer dip, which feature 7 layers of Mexican dip favorites. This dip, features 7 layers of Italian deliciousness. The cream cheese layer at the bottom is outrageously delicious! It is followed by layers of marianra sauce, mozzarella cheese, sausage, pepperoni, olives, parmesan cheese and parsley. Seriously. Is your mouth watering yet?! In a medium bowl, cream the cream cheese and Italian dressing mix together and spread on the bottom of a 7x10 baking dish. Pour marinara sauce over the top of cream cheese layer. Sprinkle mozzarella cheese over sauce. Then sprinkle sausage over cheese. Next, sprinkle chopped pepperoni over sausage. Next, layer olives over pepperoni. Lastly, sprinkle Parmesan cheese over olives. Place dip in oven at 350 degrees F for 15 minutes. Finally, sprinkle parsley over the top and serve with toasted baguettes. In a medium sauce pan over medium heat add olive oil, garlic and onion. Sauté until onion is tender, about 3 minutes. Add basil, tomato sauce, salt, sugar, red pepper flakes, and pepper. Simmer on low for 10 minutes. This is completely genius! What a great idea and I bet it tastes pretty amazing too! Wow, what a great spin on 7 layer dip, definitely going to try this, will let you know how it turns out! This looks so good!! I love the dressing mix in the cream cheese!! I think a antipasto version would be delicious, too! This was a huge hit at a family dinner. Everyone loved it. My grown kids said it reminded them of bagel bites they ate as kids. I am sure it will become a family favorite. I made this for our family Christmas party and they loved it. I did adjust the recipe to make more. I also use smaller pieces of pepperoni and more crumbled sausage. I wanted to make sure everyone got a bit of sausage with every bite. Very good recipe that I will make again.